What are Gem Essences and What Are Their Benefits? If it weren’t for gems, we wouldn’t have many of the modern technologies we enjoy today. They are found in televisions, quartz clocks, lasers, portable phones, and personal computers. Radio frequencies are only one of many vibrations they can amplify and transmit. Gems have been highly regarded by various cultures for centuries. It wasn’t just their rarity or beauty that have been so highly prized, but also the energy they attract and emit. Historically gems have been used for physical, mental/emotional, and even spiritual well-being throughout the Americas, Hawaii, Greece, Egypt, Northern Europe, China, India, Australia, and Tibet. Since the jade jewelry used by the Maoris in New Zealand is known worldwide, we can add them as well. https://www.magnificentu.com/wp-content/uploads/2018/09/MagnificentU-4-1-300x70.png 0 0 Takara https://www.magnificentu.com/wp-content/uploads/2018/09/MagnificentU-4-1-300x70.png Takara2013-09-10 16:20:572016-12-24 21:40:18What are Gem Essences and What Are Their Benefits? It literally happens in the blinking of an eye. As Americans have gone about celebrating the 4th of July and their liberty and independence from what they considered tyranny and British oppression, I am reminded of the many ways in which humans continue to struggle with freedom in its many forms. The definition from Dictionary.com – lib·er·ty [lib-er-tee] – noun, plural lib·er·ties. Living outside the box is a very revolutionary idea and not an easy one to accomplish. Its something I’ve found myself working on a lot lately. What do I mean when I say living outside the box? I mean looking at what I perceive as my reality and taking off the box that I’ve placed around it so that it can be in its truth, not my perception of what truth is. Or it can transform into the reality I want to have versus the reality I currently perceive and perhaps don’t necessarily like all parts of. Wow, sounds a little out there. Long ago and far away … I had a visitation by a wild boar. Now who on earth makes goofy statements like that? Seriously? Sometimes I think I am the strangest person I know. Anyway back to my tale . . .
Once upon a time back when I was first “waking up” from my slumber of forgetting who I really am, I took an extremely esoteric* class called Women’s Wisdom. During one of the weekend workshops we did a guided meditation** where you meet your “totem animal”*** for each of your main energy centers (chakras****). A very effective way to remain calm and at peace is through Meditation. When you can drop into a theta brainwave state at will, emotions are disconnected. You are calm, cool, and collected no matter what. It makes things easier to think, make good decisions, and not go into fear. You can also come out of it at will and be as upset or depressed as you feel you want to be. It becomes a choice, not a reaction to circumstance. I also have some fabulous products that use energy healing and aromatherapy that help people thrive and/or remain at peace when faced with chaos and uncertainty. How much have you changed over the years? If you are a parent, do you listen to yourself and think, “I sound like my mother (or father).” That “truth” may make you smile or cringe depending on your opinion of your upbringing. You are here to personally evolve – stretch, grow, move beyond fear, find courage and your unique voice. Along the way you gain poise, creativity, compassion, confidence, and a deeper understanding of truth. Ultimately you are aiming for mastery – a state of union, harmony, and synchronistic flow with the Divine and the world you find yourself in. For years I’ve called it hovering and I liken it to the behavior of a hummingbird. They appear stationary, yet their wings move so quickly one can hardly see them. They are flitting from place to place, enjoying the sweet nectar of each flower and then moving on to the next sweet morsel. And then at some point they leave and travel hundreds, and sometimes thousands, of miles on a journey that seems impossible for something their size. 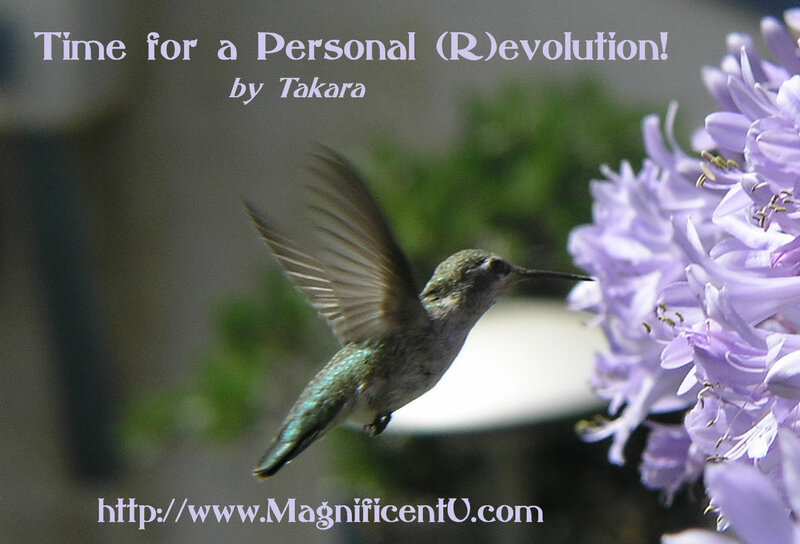 Consider yourself the hummingbird and each of your life experiences a flower. Do you allow yourself to get damaged by the thorns? Or is this person, place, or situation so mesmerizing that you get stuck there not even realizing that right around the next corner is the opportunity you’ve been waiting for or praying for. Are the things from your past so painful that you can’t even see the beauty of your now? Have you allowed situations and self talk to completely define who you are and how you perceive the world – never changing and always dismal? When you get in flow, when you heal all that pain, when you rise up above the mayhem and seek the miracles, you will find them. The only thing standing in your way … is you! I wish that were not true. I wish I could wave a magic wand and heal all the pain and suffering in the world. But alas, there is no growth in that. The people experiencing the pain would not grow into understanding how truly magnificent they are. They would remain forever disempowered seeking answers and rescue from some one or some thing outside themselves. That is not the way of this world. It is not the way of the mystic – the seeker of truth, the seeker of enlightenment. It is so easy to know if you have grown. Do you seek approval from outside yourself? Do you get angry or upset over people or situations without consideration of the other people involved and their potential point of view? Do you say, or not say, things from fear of rejection or in trying to “fit in” or be accepted? Do you get angry or hurt if you help someone and they don’t seem to appreciate it? Do you still blame someone or some situation from your past for doing you wrong? Do you insist on doing everything yourself? Are you sad, angry, or frustrated because your dreams have not been achieved? Do you try to “fix” people’s lives? Do you find yourself saying, “They should ______” – setting yourself as judge over what others should or should not do? Do you beat yourself up with guilt, shame, blame, and victimhood – thinking you should do this or you should do that or this should not have happened? Do you allow situations outside your control to affect your emotions? Do you stay in situations or with people that cause you to question and doubt your value, your worthiness, or your skills? Do you avoid people and situations because you lack the courage to gently speak your truth? Do you consider yourself better than others? Do you want someone to heal or fix you and your problems? If you answered “yes” to any of the questions above, then these are areas to work on in order to grow and evolve. Do you help others without need or desire for appreciation or acknowledgment? Do you take actions or say words because you “know” it is what you are to do? – Even if it is highly uncomfortable to do so? Do you ever take risks – going places, meeting people, trying new things – because your intuition insists? Do you graciously end relationships that are disempowering to you? Do you take in each new situation you find yourself in without emotion and respond to it from heart knowing? Do you have the courage to walk away from situations or people that cause you to question and doubt your value, your worthiness, or your skills? Do you love, honor, accept, and appreciate others? Do you love, honor, accept, and appreciate yourself? Do you allow others to experience the life they have created for themselves without interference or judgment? Are you able to enjoy great relationships even with people with a vastly different belief system or point of view? Do you quickly admit your mistakes and apologize when your actions negatively affect others? Do you treat everyone equally? Do you routinely experience flashes of inspiration or miraculous synchronicity? Do you treat animals, plants, and insects with honor and respect? Are you able to manifest your goals, dreams, and desires? Do you enjoy your life journey as much as the destination you have been seeking? Do you seek assistance when you have exhausted all your own knowledge and skills in dealing with an issue or growing and evolving? If you answered yes to many of the questions above, then you are well on your way to holistic life mastery. There are times in the journey when assistance is not only needed, its practically mandatory. Certain issues, repeating patterns, trauma dramas from the past, and beliefs are often so firmly stuck that an outside teacher, counselor, or technology is required – and often all three. As I have traversed the ups and downs of earthly life and grown as an individual over the past 20 years, there have been times that teachers and technologies have miraculous shown up for me. Other times I have experienced the inner knowing that I must call this person, read this book, or go to this place for assistance. I offer all that I have learned along the way and the tools and products that I’ve been inspired to develop in the form of books, Dancing Dolphin Energy Healing Oils & Mists, private consulting sessions, and training. You get to decide the level of support you need, desire, and can easily afford. Regardless of the situation you face, or the issue you wish to address, the one thing I most often recommend is a Custom Dancing Dolphin Blend created just for you. Your Higher Self and guides know exactly what you need in every moment. And through some minor miracle, I am able to tap into that information and alchemically create for you the perfect energetic cocktail to support you and help you blast through whatever issue or plateau you seem to be stuck on. Get Your Custom Blend Here! The Past is the past is the past is the past…. GET IT?????????? The past is over… done… gaput… we don’t get do-overs…. We LEARN from the past… We DON’T, however, get do-overs. So take what you have learned…. And apply it to the NOW. It is interesting because I really have never done the “past” thing. I have (before the past few years) always lived in the future. Living in the NOW has been a difficult transition for me – but I am making the leap…. Well, most of the time. So why “live in the past”? Folks do it to have someone to blame, for an excuse not to go forward, remembering that is when things were good for them (at least they remember it that way), they don’t know how to go on, etc. What is problematic is… that YOU DON’T GET DO OVERS… IT IS GONE. The thing to remember if you are one of those folks who keep bringing up a past indiscretion, a past betrayal, etc. is how much of the NOW, the today, your 24 hours that you have in a day… are willing to give to something you cannot change? If you are giving away your NOW, the person who did the betrayal, etc. wins…. You lose… it is as basic as that. You don’t need to forgive them… you do, however, need to forgive “the self” YOU….. You say, why do I need to do that? Well because there is always a part of us… could be totally subconscious, that thinks perhaps if we would have done something different, said something different, been something else, then the “act” wouldn’t have happened…. So forgive “the self” and get on with your life. One way to do that is to figure out what you learned… and YES, you will have always learned something… it might be as basic as “I don’t deserve to be treated like that.” So don’t be. Learn from the situation and live in the now.!!!! Past: I leaned that whatever happened in my past, made me stronger and wiser. Everything has experientially made me what I am today. Bad experiences are equally important as the good ones. I forgive myself for all the mistakes I did and the people who “wronged” me. Future: Nobody knows what will happen in their future, and that is the whole point which makes life exciting. Whatever happens, I know that at the end of it, it will be all right. I will be happy no matter what and will always have some people by my side who love me for who I am. I will have more learning experiences like I have had in the past and I will also make many more good memories to remember in the coming time. Present: The time I have now will never come back. I cannot live it again, so why not make the best of today? I will do whatever makes me happy. Spread love in the lives of people who share my life. Whatever decisions I make in my present will affect my future, so I will make my decisions wisely, but I will not worry about the outcome. https://www.magnificentu.com/wp-content/uploads/2018/09/MagnificentU-4-1-300x70.png 0 0 Takara https://www.magnificentu.com/wp-content/uploads/2018/09/MagnificentU-4-1-300x70.png Takara2013-05-09 15:30:522016-12-25 20:45:18The Past is the past is the past is the past…. GET IT?????????? The Blame Game – Do You Participate? Blaming sets up a situation in which it becomes difficult to move forward and puts resolution in the hands of others…. As we finally start understanding that the world outside of us is a reflection of the world inside of us, we finally begin to understand why we may feel confused about who is to blame for the problems in our lives. If we had a difficult childhood . . .
we may wonder how we can take responsibility for that? In our current relationships, the same questions arise…. We all know that blaming others is the opposite of taking responsibility, but we may not understand how to take responsibility for things that we don’t truly feel responsible for. We may blame our parents for our low self- esteem, and we may blame our current partner for exacerbating it with their unconscious behavior. This all seems to make sense. After all, it is not our fault if our parents were irresponsible or unkind and we are certainly not to blame for our partner’s bad behavior…. Sooooooo, perhaps the problem lies with the activity of blaming itself. Whether we blame others or blame ourselves, there is something aggressive and unkind about it. It sets up a situation in which iy becomes difficult to move forward under the burdensome feelings of shame and guilt that arise. It also puts the resolution of our pain in the hands of someone other than us. We cannot insist that someone else take responsibility for their actions; only they can make that choice when they are ready. In the meantime, if we want to move forward with our lives instead of waiting around for something that may or may not happen, we begin to see the “smartness” of taking the situation into our own hands. We do this—- be forgiving our parents, even if they have not asked for our forgiveness, so that we can be free…. This does NOT have to be in person or a letter… just forgive them… We end the abusive relationship with our partner, who may never admit to any wrong doing, because we are willing to take responsibility for how we are treated. In short, we love ourselves as we want to be loved and create the life we know we deserve. We leave the resolution of the wrongs omitted against us in the hands of the universe, releasing ourselves to live a life free of blame. So the Blame game is: a person feels guilty or uncomfortable about something. That person finds a rationale why someone else is to blame. That person blames another. This person gains several benefits from this. He/she is excused from what they have done (which means they can do it again). They can play ‘poor me”. They can also claim social capital over the other person because that person will owe them something in return for their apparent failure. This game is driven by our need to explain …. Also the first person gets to play persecutor and gets to have associated pleasant feelings of power…. Look what you made me do….. If it wasn’t for you……. All in all… watch out for the “Blame Game”…. I personally do not like this game, do you? But I must admit – I have played it…. not gonna anymore…. Diane Mickelson (PhD, MS, BS) has 35+ years as clinical/educational psychologist and clinical hypnotherapist. Check out the services she offers along with her husband, Loren (PhD, MA, BS). They bring a varied eclectic educational and experiential background to help facilitate an individual’s change. Take advantage of their free newsletter – www.drsmick.com. Diane writes a daily blog at www.dianesmusings.com – check it out. They look forward to helping you facilitate a change in your evolution. Change is here NOW! https://www.magnificentu.com/wp-content/uploads/2018/09/MagnificentU-4-1-300x70.png 0 0 Takara https://www.magnificentu.com/wp-content/uploads/2018/09/MagnificentU-4-1-300x70.png Takara2013-04-03 15:54:542015-06-04 15:57:40The Blame Game - Do You Participate?